In all corners of Grey Oaks, the celebration of nature is apparent, and elemental to the timeless appeal of this magnificent country club community. 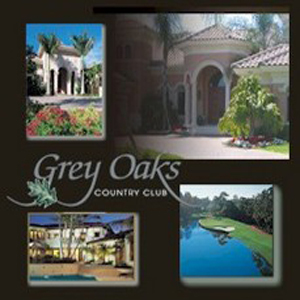 Nowhere is this more evident than in the prestigious estate neighborhoods at Grey Oaks where the breathtaking vistas are as varied and irresistible as the architectural designs of the homes. Rolling emerald green fairways, glistening lakes and panoramic views of nature all come together to gracefully outline the perimeters of these very private, individual island enclaves. Master planned to harmonize with the landscape’s enriching aesthetic appeal, an exclusive number of new estate residences are now available for occupancy in several neighborhoods. Choose from a variety of villas in Capistrano that feature fountained courtyard and vaulted portico entries, circular foyers, formal living and dining rooms with coffered ceilings, private studies, and center-island kitchens with granite countertops and butler’s pantries. The warm and embracing traditional European styling which characterizes all of the residences at Grey Oaks continues with the latest Collection Homes, each of which offers every conceivable comfort and luxury, from soaring rotunda entries to private exercise rooms and separate guest cabana suites. In classic Misner-inspired fashion, interiors meld with exteriors to bring picturesque outdoor settings inside. Lush privacy gardens provide soothing views to enjoy while bathing or relaxing, while media rooms and libraries in many homes overlook or open onto larger terraced gardens. The delights of al fresco living is promoted as well with shady lanais that draw you out onto spacious sundecks with lagoon-style swimming pools featuring raised spas and soothing fountains.